Hello Crafty Friends! I have had a lot of questions about the products I use for my tutorials and pulled them all together for my Craft Desk Essentials 2018. I did this last year and a few items remain the same but I have found some new ones I wanted to share with you:) You can watch on my YouTube Channel, Just Click Here. Next > Gerda Steiner – Bats! Thanks, Tina. 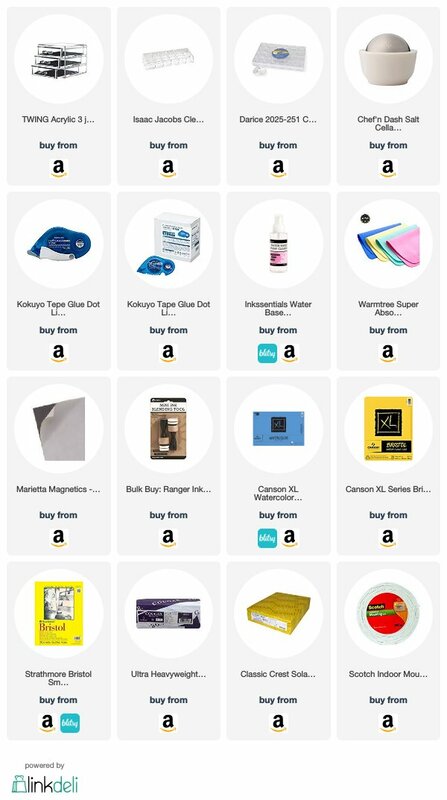 Did my shopping on Amazon and saved your links for later reference. I LOVE that you look for the best buys and share them with us. I found the jewel picker and had to get it as I’m not happy with same ones you had. The 3M tape is a great buy as well! Also picked up the shamies. Thanks for the tips! Love your videos. Have a blessed Sunday. Tina, have you tried micellar cleansing water to clean stamps? It is amazing and doesn’t hurt my stamps. It just seems to liquify the ink (no matter what kind). I just pour some onto a microfiber cloth. I use Garnier SkinActive. Large bottle – small amount of $. Tina, I should also say that these were my own experiences and I haven’t tried on Staz On. Just a suggestion for you to possibly try. Thank you Tina for sharing all these fabulous tips and Links! Wow. My faves: the 3 drawer embossing powder holder, the magnetic sheets, the nail polish holder for the distress ink applicators. I always get so much inspiration and a shot in the arm of pure joy when I see your cards, creations and ideas. It’s a pleasure to visit your site. I’m off to Amazon to put in an order! Thanks so much again. Have a blessed and wonderful day!